It’s a new name and indeed a new car and it won the European Car of the Year award for 2009 months before you could even buy it, but is the replacement for the aging but not universally loved Vectra all its cracked up to be? The fact that Ford decided to stick with the Mondeo name, yet Vauxhall decided to ditch the name Vectra, highlights maybe just how un-loved the old Vectra was and by consigning the name to the trash bin, Vauxhall hopes it will erase any memory of the car and, avoid the worst case scenario of the Insignia being referred to as the new Vectra and that’s the first good decision, as the two cars are as different as chalk & cheese. Before we say so long to Vectra and it rides off into the sunset, the Vectra was never a world beater, it did however sell over a million units across Europe and I have to say, in a funny kind of way, I always thought it was a very decent car, which was never given a good hearing from the start, primarily due to it being slammed by the overpaid pompous presenters from that popular comedy show, Top Gear, who unfortunately seem to carry great sway with the public. Fact was, that for an ordinary person, wanting a big reliable car, without paying crazy money, the Vectra was absolutely fine, it offered a lot of bang for your buck and it did the job well, but its biggest failing was that it just wasn’t a very fashionable car; it wasn’t something you would dream of, or aspire to own. So this time round, Vauxhall have firmly gone down the ‘you know you want it’ aspirational route and come up with a car that frankly, that if you ripped the badges off, you really wouldn’t be able to tell who made it, and indeed, some of the early spy shots of the car lead journalists to claim it was the new BMW 5 series. Starting with the name, its clear Vauxhall (GM) are aiming to foster the belief that the Insignia is something special and looking at the dictionary definitions of the word ‘Insignia’ its shown as “a token of personal power, status or office’ and that’s just what GM want, a car that a buyer perceives gives them a more upmarket status, and carries a greater car park prestige. So how different is Insignia from Vectra, well the answer is totally and so you should forget any opinions you ever held about Vauxhall and I strongly advise you to take a close look at this car for yourself, because it really is up there with the best in its class such as Mondeo, Passat, Accord, Laguna, C5 etc, but is the Insignia is the best of them, I really don’t know, but probably not. Its very early days yet for Insignia and I guess how people judge this car will in large part, depend on how reliable it is, but something we can be certain of, is even at this stage this is definitely one of the best looking cars of its size that you can buy, so lets just hope the new Vauxhall that it lives up to its pretty face. On the outside, the car looks well put together and everything opens and shuts as it should and the paint finish is excellent, giving the car a really upmarket appearance. The car sits well and looks purposeful and attracted complimentary remarks from everyone who saw it, although there were also one or two negative comments about the huge Vauxhall badge on its nose. The boot (hatch) is cavernous, with good access. Inside, well, if you like buttons, you are just going to love this car, as there are things to push, flick and twist everywhere and all of these pushy, twisty things feel very precise and well engineered. For me however, there were just too many buttons and I didn’t feel they were particularly logically laid out, although after using it for a while, you kind of figure out where the important ones are, but despite that there is no doubt it is kind of impressive and awakens the little boy in you as you appear to be in charge of some complicated flight deck. The dash curves round in a very attractive and modern way and no matter what your personal tastes, you would find it hard to dislike the overall appearance. The instruments and dials are clear and easy to read and the quality of the materials used (mostly plastic, as with all cars) was very good, with the possible exception of the wood veneer which looked a little false. The seats were comfortable with plenty of adjustment and you really do feel you are sitting in the car, rather than sitting on it, as you do in so many others. Rear room was OK, that’s all I will say, as the semi-coupe type styling doesn’t give you much headroom if you are tall and we found the passenger and driver both having to pull their seats forward to a position they would not normally choose, to give the rear seat passengers some breathing space. The integrated stereo and digital radio was a decent quality, although the digital radio tended to lose its channel frequently, in fact, far too frequently for us and whilst that’s not Vauxhall’s fault, it demonstrated that even now, digital radios are really not ready to be fitted in cars. One thing that disappointed us was the lack of Bluetooth connection for mobile phone and our car was an SE, costing over £20,000 and whilst is available as an option costing just under 150 quid, its standard across the range in all Mondeo’s and with the use of hand held mobile phones in cars now is such a major issue and considered to be very dangerous (apart from being illegal), we wonder why on earth such a potential safety benefit was overlooked by Vauxhall on what is the freshest most modern car in its class and in my mind, that shows a real lack of forethought. We didn’t much like the door mirrors, particularly on the near side mirror as because of its shape, it just didn’t give you enough of a rear view and for some reason whilst driving in the rain that the mirrors never seemed to clear. We thought the ‘A’ pillars were too thick and obstructed our view as well, petty niggles, but niggles all the same. Whilst we are moaning and to be fair, I might be the only person this applies to, but every time I took the car out of reverse gear, the little release slide zapped back into place, nipping my finger in the process ‘which hurt’. On the road, the Insignia is quiet, refined, composed and produced very little road noise and in those areas is probably as good as anything you can buy for that money (and that includes the so called prestige brands). The steering was precise and the brakes were as you would want them to be. We did however think gearbox was a little too heavily centred to the 3rd & 4th position and we did notice some transmission clunk if we laboured the car a little. In terms of performance, we did have a ‘little play’ and whilst the 0-60 figure of 7.2 seconds is fairly quick, the Insignia didn’t feel quick and don’t think for one moment that’s a criticism, as its not, because the Insignia is quick, it just doesn’t make much of a fuss about going fast, its quiet, relaxed and with little of the obvious signs of pushing it too hard, such as torque steer. In fact, it’s a nice experience not too have to fight with the car when it’s driven aggressively. Should the worst happen, the Insignia has all the tricks in terms of keeping you safe and this starts with what Vauxhall refer to as ‘an optimised body structure’ they claim will protect the occupants in every kind of impact situation. Other safety features include, double pre-tensioned front seat belts, pedal release system, side impact protection beams and active front seat head restraints. The cars front airbags are two-stage to prevent injuries caused by the air-bags inflating too quickly, and front seat side airbags and full length curtain side airbags are standard across the range. For those of you wanting to fit a child seat in the front, there is also a switch to deactivate the near side airbag. As with pretty much all cars today, the Insignia also has all the usual things like ABS, EBD, ESP and traction control, so all-round, a safe package, achieving NCAP ratings of 5* for adult occupants, 4* for child protection and 2* for pedestrian protection, which by coincidence are the exact same scores as the Ford Mondeo achieved. Our test car was an SE 5dr with the 2.0 litre 220ps Turbo engine, which is the standard 2.0 petrol engine in Insignia and comes with a 6 speed manual and an on the road retail of £20,866 and we were very surprised that as the only 2.0 petrol offering came with in such a high PS rating, leaving you with no option but to choose a 1.8 if you want a more normal power output. Keeping Vauxhall’s proud ‘green’ boasts well in mind and after driving the car carefully, for 9 days on a regular 60 mile return commute, most of which is main road, we only managed to achieve a staggeringly poor 23.8 MPG and frankly that’s appalling. It doesn’t stop there either, as this ‘ECOTEK’ branded engine, chucks out a mind numbing 209 g/km of exhaust emissions and surely, that’s enough to kill plants and small fury animals as you go past and this hardly seems to support the claim by Vauxhall that they are at “the forefront green automotive initiatives” and to put this into perspective, the Vehicle Certification Agency publish all CO2 figures for every car sold within the UK and a quick look reveals a BMW 325i Coupe with a 2996cc petrol engine produces a CO2 of 170g/km and that almost 40g/km less than this state of the art, newly released Insignia, so we think it’s a case here of words being cheap, but clearly meaningless, and I see little for Vauxhall to be proud of in this area. Whilst we haven’t tested the diesel yet, we were told by a Vauxhall delivery driver that he achieves around 35mpg when delivering the diesel versions, which is also, a far cry from the 48.7mpg combined average claimed in the Insignia brochure. All this said, the Insignia is a damn good car and of that, there is absolutely no question and its also arguably one of the best looking cars in its sector and without doubt, Its absolutely light years ahead of the Vectra its replacing and if you are being given one as your company car, well you are going to think all of your Christmases have come at once and maybe I should end this report here? I can’t however do that, without going back to the fact that the Insignia was chosen as ‘2009 European Car of the Year’. Fifty Nine international journalists made this decision and who are we to say they are wrong, but fact is, the Insignia was given this award before it was even on sale anywhere in Europe and for me, that’s completely wrong, as none of us know yet how good this car will turn out to be, or indeed if it will be plagued with problems (its happened in the past) and so I approached this test in a much more sceptical way than I would normally do, and I will be frank, in the week or so we had the test Insignia, we did find things that were not ideal and we did find weaknesses in the car, but we expected too and we haven’t found the perfect car yet and I don’t suppose we ever will. Personally, I would much rather have seen the Insignia on the road for a while, before it was burdened with this title, at which time, it might truly justify the award and we could then all applaud Vauxhall for making a superb car, but at this point, I fail to see how any one at all can take this award at all seriously. If you are going for a car of this size, well Insignia just has to be on your list of cars to look at along with the now proven and very reliable Ford Mondeo, which is also a modern hi-tech masterpiece and like Insignia, its a quality product, although the Mondeo does have the advantage of a pretty good track record on its side as it was launched in 2007. Don’t ignore one of our personal favourites, the Skoda Superb with its excellent Volkswagen Audi Group build quality and enormous bang for your buck and of course, check out Toyota’s new Avensis for something from the East. Citroen C5 fits in the bracket, as does Renaults Laguna and of course, whilst it’s a little old now; you must try a Passat for size also. Which should you choose? Well, they are all OK, they all have great pedigee’s and most of them are fairly recent cars, but if you do opt for Insignia, for goodness sake, pay the extra £146.81 for the Bluetooth system. 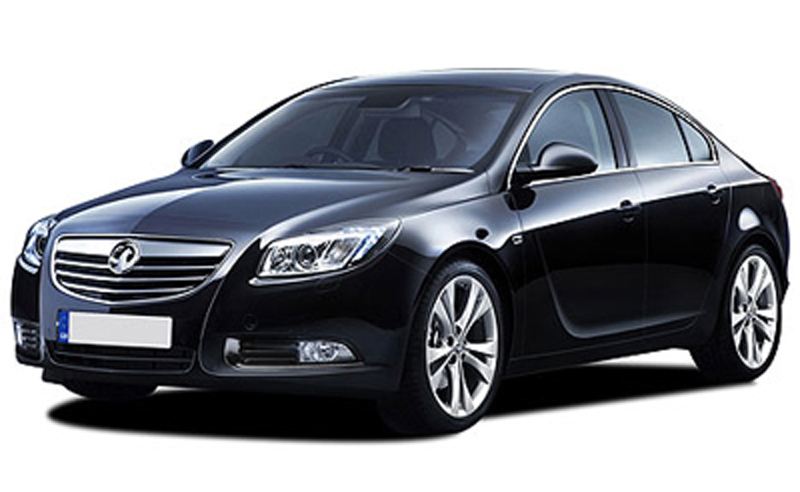 For a quotation on the Vauxhall Insignia or any other vehicle, please contact us.